Search Engine Optimization pricing is about as clear as mud. With SEO in high demand and high supply, it’s hard to know what pricing is worth it let alone legit. Countless businesses sell SEO services but rarely do they advertise a breakdown of cost. How do they even determine what the pricing is? What different payment models are good or bad? What’s the average cost? Is there anything to be skeptical of? In this post, we’ll answer all of those questions and more. Here is the definitive guide to shopping for SEO services and what you can expect to pay an SEO company for their services. How Do SEO companies determine pricing? What are different payment models SEO companies use? 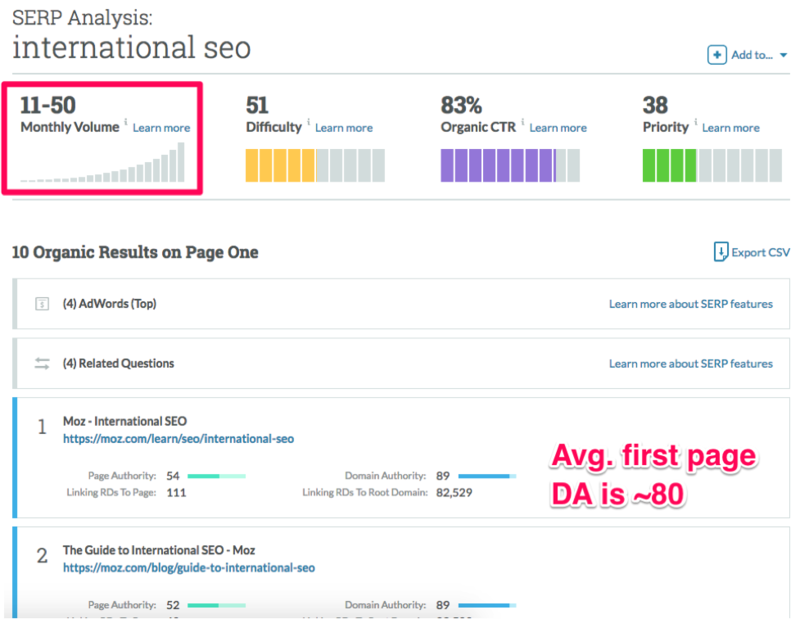 What are average SEO costs? When looking at SEO prices, it’s common to gasp in shock at how expensive the service is. Thousands of dollars at a minimum can feel like a huge expense. It leads most to wanting to try SEO on their own. Organic search (SEO) has the best ROI out of any channel. But SEO isn’t free. Just because you are not directly paying for advertisements like PPC doesn’t mean SEO doesn’t have expenses. We researched the top SEO firms that can grow your business. Expertise: Depending on which company you look at, many have expert-level SEOs that have worked with major clients around the globe. Working with credible experts in the SEO field who have seen big wins at similar companies will cost a pretty penny. Why? Because their track record is consistently great, making their time extremely valuable. Expertise will cost you more hourly and on a project by project basis. Manual overhead: just like anything in life, nothing is free. And the same applies to SEO. SEO is backed by employees doing work. Whether it’s writing, developing a content strategy, or any maintenance you might need in the future. All of these have a cost. So depending on what your business needs in terms of content per month, maintenance, etc, your costs will reflect accordingly. A company that wants to produce 20 unique content pieces each month will pay much more than a company looking to do five. Infrastructure: costs like upfront development, site changes, or structural changes to your business can apply based on needs and existing setup. Your needs: content, keywords, research time, projects, etc. Their time: how much employee time is required for your business alone. Their expertise: their past history dramatically impacts their time costs. For choosing SEO services, what types of payment models do SEO companies use? Are any more advantageous than the others? Let’s cover some of the most common payment models in SEO and what to expect from each. SEO companies that charge by hourly rate are usually doing maintenance and upkeep for your SEO strategy, or some form of audit and analysis. It is not recommended to use hourly rates for traditional SEO services or if you are looking for a growth partner in an agency. You want your SEO agency to be a part of your success, not a company that bills you hourly and racks up charges. 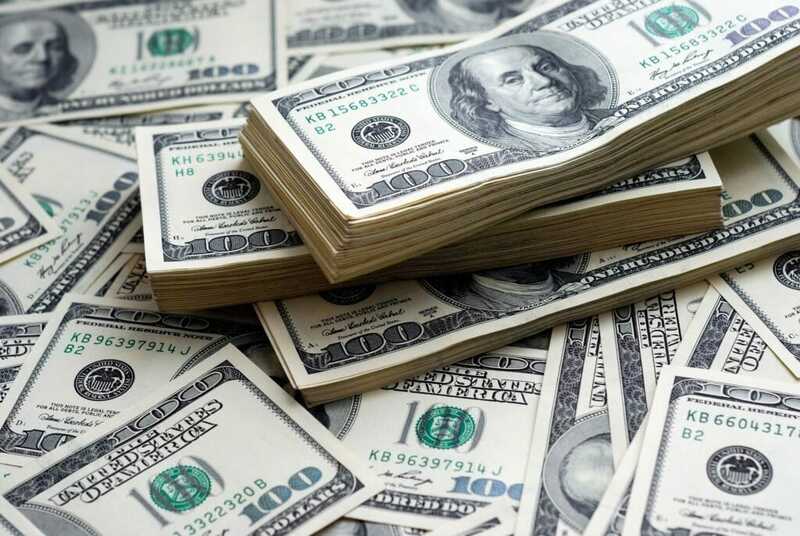 If you do use hourly rates, make sure you are trusting your money with a reputable, experienced company. Long-term contracts are a common SEO pricing model that companies will suggest after conducting an audit on your site. They can be helpful as all-inclusive style packages where you can bundle services based on your needs so that you aren’t paying multiple companies for services or getting up sold for add-ons. Monthly retainers are the most common form of SEO services and are usually put in place after you have done significant upfront work with an SEO agency or freelancer. For example, once you’ve developed multiple projects, established a good infrastructure, and written good content, monthly retainers can be put into place to maintain results and continue development at a less aggressive scale. These will often be very reasonable in pricing ranges, too. Project-based SEO pricing will allow you to be more selective on what you want to pay for. For example, if you want just content and e-books, you can pay separately for those projects! Or if you want keyword research and site architecture, you can pay for that. Project-based pricing exists at almost all SEO companies and is a great way to selectively buy what your business needs. If you are more focused on getting content for your website growth and organic traffic, SEO and content companies offer content-based pricing that scales up or down based on your desired amount. So, what are the average costs for general SEO services? Taking the different pricing models above, it’s obvious that pricing will differ dramatically based on what model you decide to go with and how vast and ongoing your needs are. One time projects might cost a ton whereas smaller development and maintenance could be less. Don’t be shocked by the high price range, as that’s far less common than paying in the $500-$5,000 range. Conversely, be wary about SEO costs if they are too low, too. With SEO, super cheap pricing often results in discounted effort and results (more on this later). 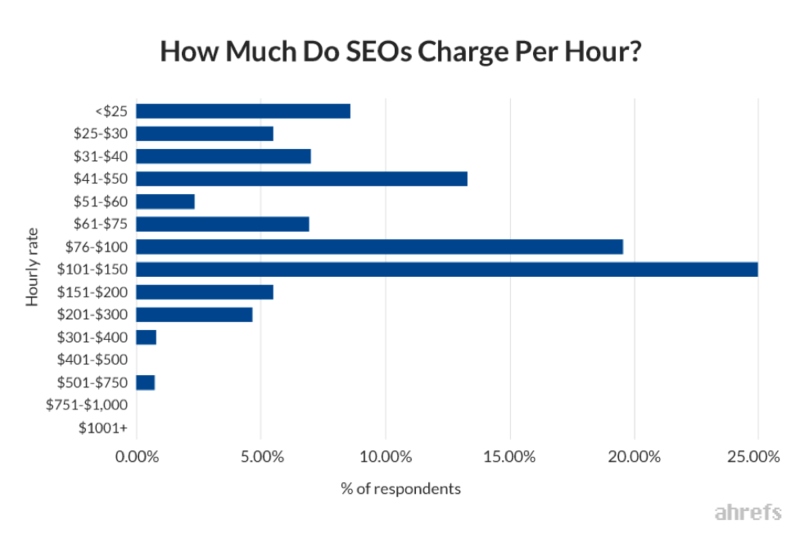 A recent 2018 study conducted by Ahrefs surveyed 357 respondents from agencies to consultants to freelancers to see how much average costs were for SEO services. For monthly retainers, one of the most popular ways to charge for SEO services, the average retainer cost was $501 to $1,000 per month. With hourly pricing, you can expect to pay on average around $100 to $150 per hour for SEO services. For single projects, the average cost was the same as a monthly retainer, landing at $501 to $1,000. 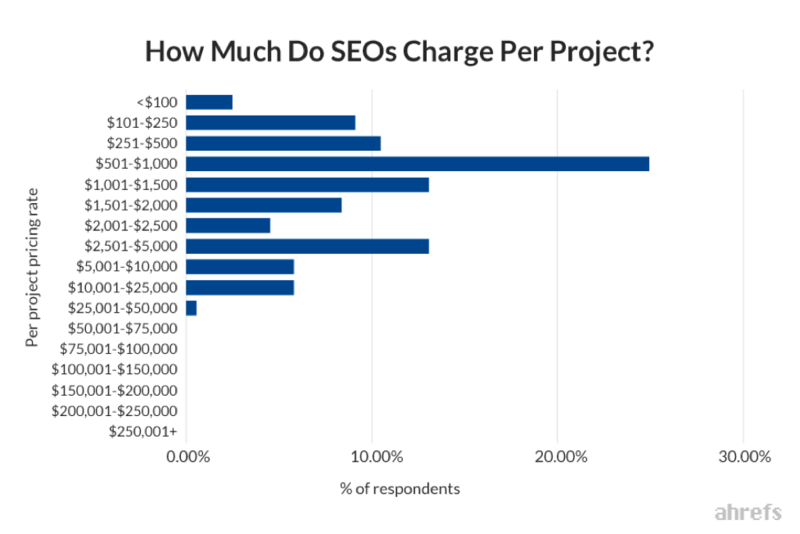 This latest data set from 2018 showcases the average SEO costs you can expect for different pricing models, projects, and ongoing agency work. The catch with SEO is: you get what you pay for. You have control over what your SEO costs are because it’s heavily dominated by how aggressive you want to be. More, better content marketing means more expensive cost per word. A better site audit means more research and higher costs. A bigger, longer project results in tons of overhead and therefore, higher costs. Conversely, going for less content at a lower quality will be cheaper. But when your business results depend on it, you should price out what you can reasonably afford and see if the outputs (content, keywords, projects) is worth the money. Working with more experienced agencies or freelancers who have decades of experience won’t be cheap, but your odds of success are likely higher due to more experience. Because SEO is such a popular service in the world today, thousands of companies offer the service. SEO services are extremely saturated, making it increasingly tough to stand out and get clients. And this opens the door to deceptive marketing tactics to help them do just that. Here are a few things to be skeptical of when looking at an SEO company, their plans, and their pricing. Being well-versed in SEO services, I can’t count the number of times I have seen SEO or digital marketing service companies guarantee results. In the SEO world, none of that is realistic. You simply can’t guarantee any rankings, traffic, conversion rates, or timeframe for when to expect any results. There are 500 to 600 algorithm changes every year with Google. This means that tactics change faster than you can blink and nothing can ever be promised. And there are a ton of tactics. What works now may not work in a year. And building up your traffic over time might not pan out if specific tactics fade away in six months due to algorithm changes. Beyond that, every company is different. Just because you drove results for a client and show a case study doesn’t guarantee results. Run for the hills if you see a company promising you any type of results. Rather, they should be promising a great relationship and putting their entire team to the task of helping you grow. 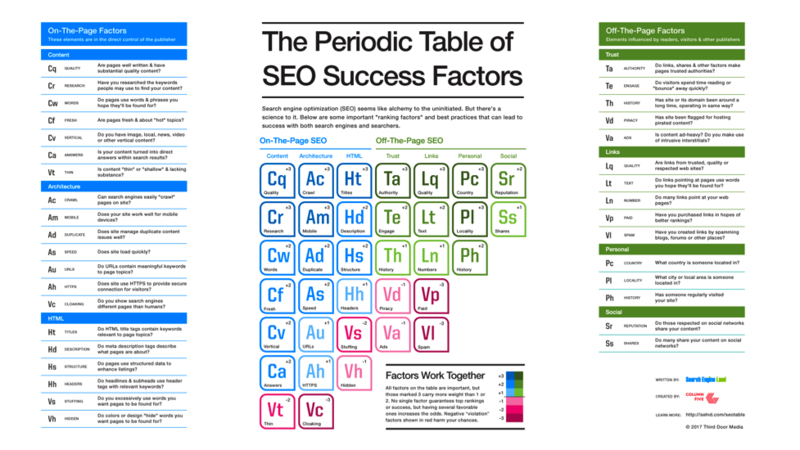 Content marketing is the bread and butter of SEO, as you likely know. But one common trend seen in the SEO service space is companies selling massive content packages. While content is awesome, and lot’s of content is great, lot’s of sub-par content is worthless. So “good” content isn’t good enough anymore. You can’t settle for average content. If a company is telling you that they will create dozens upon dozens of new pieces, it’s likely they are focusing too much on quantity and not quality. And quality is the only thing that has a hope of ranking in today’s landscape. Most SEO companies will initiate the process of working with you by conducting an audit on your existing site and content. This is done to initiate the relationship and build some trust as well as plan out potential services you do and don’t need. But these audits can go wrong, fast. When receiving an audit, or reviewing one with the company over a phone call or screen share, be aware of generic advice. Are they showing you screenshots of keywords that aren’t related to your niche or aren’t specific enough, showing a lack of real effort in research? Is their content game plan highlighting competitors, SERP content, and your existing content? If you notice that the advice given is generic, like “create 10 pieces a month” and “target high volume keywords,” you can tell they haven’t done the proper research. It’s no secret that your business wants to save money wherever it can. It’s natural. It’s capitalism. It’s how a modern business survives: low overhead. But this traditional and correct way of thinking has some serious downsides when looking at SEO pricing. SEO is the blueprint of your online business growth and you can’t afford to skimp on it. If you see SEO plans that are extremely cheap compared to the averages listed in the section above, it’s not worth your time and money. SEO can’t be done on the side. It’s a business expense that you need to dedicate a big budget and effort into to see success. Looking for fair pricing with Search Engine Optimization is a brutal process. Most companies don’t publicly share their SEO service costs and it can feel impossible to know what is a good deal and what is not. SEO services are usually determined by expertise/history and services needed. Different payment models can all work depending on what you need: one time projects, on-going monthly work, etc. 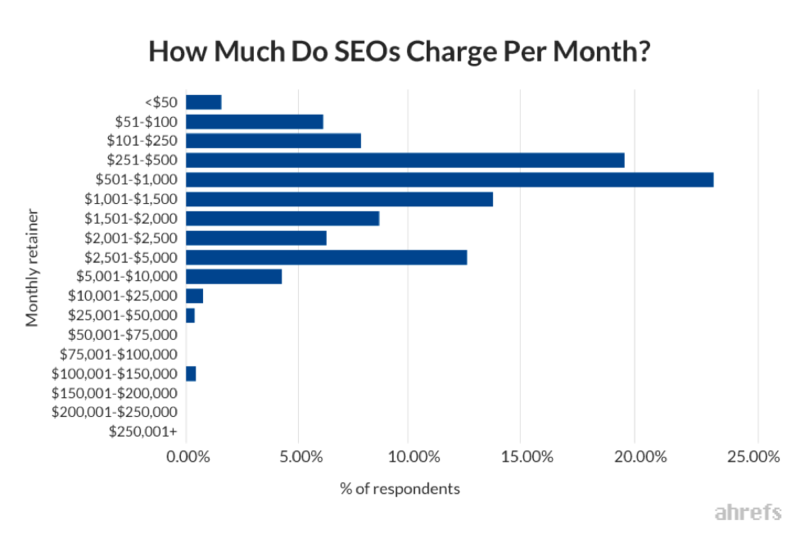 On average, SEO can cost from $500 to $30,000. Common pricing tends to be monthly retainer style where average 2018 prices are $501 to $1,000 per month. But be aware: when looking at SEO pricing and services, be skeptical of guaranteed rankings, quantity over quality, generic audit advice, and “cheap SEO” plans. They are all bogus. SEO can’t be cheap if you want it to have big impacts on your business. Follow the guidelines listed here to find SEO pricing that works for you. The principles of SEO are the same, but within certain industries some of the top search optimization firms have carved out a niche. We have found those experts for you!